Stripes, a photo by PhotoPuddle on Flickr. Today was a good day for my new year's resolutions. I didn't spend any money, the kids and I did fun stuff at home, I ate lots of fruit and vegetables and I did something new in knitting. I tried out knitting stripes in three colours as I've never done more than two colour stripes before. It went very well! I need to work on neatening the edges a little but apart from that it was all good. It also gave me the opportunity to combine my knitting hobby with my photography hobby. I do rather like taking knitting photos. I enjoy the challenge of making a piece of work look really interesting. 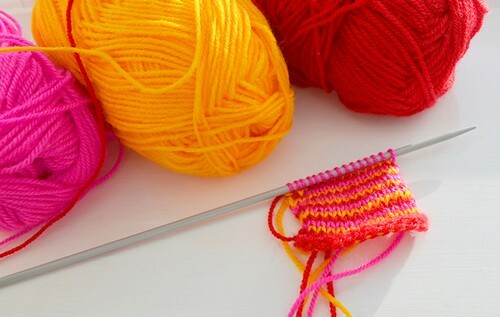 I think it's all about the colours and I love knitting with bright colours such as the ones here.